I've been reading around (here, here, here and here) and I can't really find an answer to this question: is it better to throw, for example, dog poop, inside a pure plastic bag or use biodegradable plastic? The poop and the bag are both in the landfill which is exposed to normal ambient condition and gradually, filled over. Which would impact the environment more: Pure Plastic or Biodegradable Plastic? Any answer or source would be highly appreciated! It doesn't appear that there are any specific studies comparing the environmental impact of dog waste disposed of in biodegradable vs non-biodegradable bags, however there's quite a bit of work that's been done to compare these two types of plastic, considering production, use, and disposal. One of the best studies I could find looking at the production phase is "Sustainability Metrics: Life Cycle Assessment and Green Design in Polymers" (pdf). The environmental impacts analyzed are: acidification, carcinogenic human health hazards, ecotoxicity, eutrophication, global warming potential, noncarcinogenic human health hazards, ozone depletion, respiratory effects, smog, and nonrenewable energy use. Green design principles look at such things as: avoided waste, material efficiency, avoided pollution, energy efficiency, use of renewable resources, use of local resources, design for recycling, design for biodegradability, and cost effectiveness. 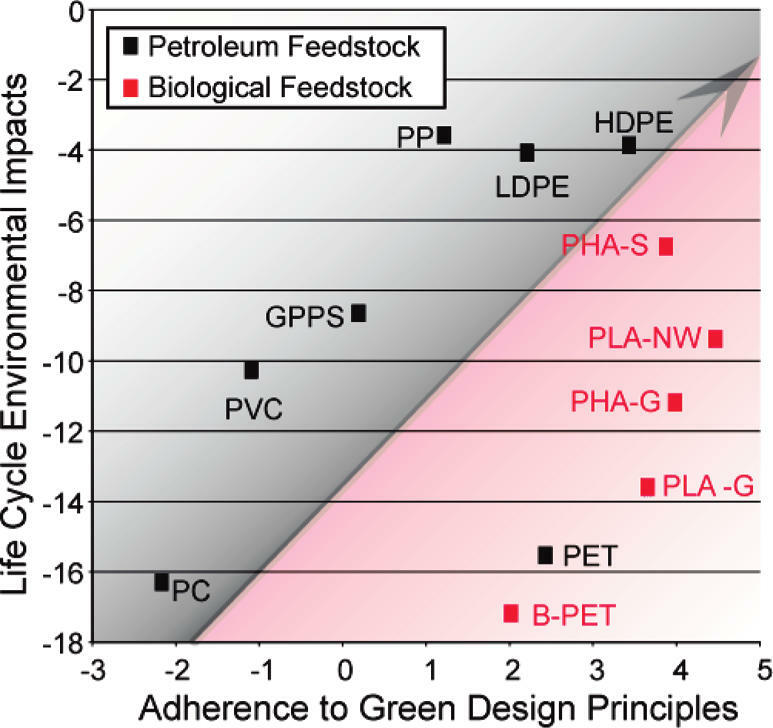 Results from this study show a qualified positive correlation between adherence to green design principles and a reduction of the environmental impacts of production. The qualification results from a disparity between biopolymers and petroleum polymers. While biopolymers rank highly in terms of green design, they exhibit relatively large environmental impacts from production. One of the main reasons that some petrol-based plastics perform better than bio-based plastics is that the plants used as feedstocks for bio-plastics often may involve petroleum-derived fertilizers and pesticides, and the chemical processes for bio-plastic synthesis can be energy and/or chemical intensive. The authors note that their study does not include LCA for use and end-of-life, due to the fact that the plastics produced are raw materials for a plethora of different products. Based on this result, it would seem clear that bio-based plastics are preferable to petrol-based in any situation where the product would be re-used several times. However, in the case of dog waste bags, it is obvious that the product will only be used once. Therefore, it's harder to say whether a bio-based bag will be preferable to a petrol-based bag. At least one study ("Bioplastics and Petroleum-based Plastics: Strengths and Weaknesses") indicates that petroleum based polyethylene (PE or PET) bags outperform one type of bio-based bags (Mater-bi, a patented biodegradable plastic product) in end of life when comparing recycling of PET to composting of the bio-bags. So, considering that dog waste bags will not be recycled, this could indicate that bio-bags will perform better in that use case. Not the answer you're looking for? Browse other questions tagged plastic biodegradable-waste plastic-alternatives compostable-plastic or ask your own question.